We would like to wish everybody a happy 4th of July. 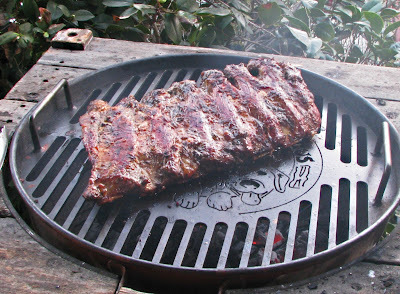 We hope your barbeques and smokers are getting a work out today. Chicken wings, beef short ribs salads and fresh corn on the cob is on our menu. What is on your grill? This Holiday is so much more that a day to celebrate our Independence. The fourth is a red letter day on our calendar. 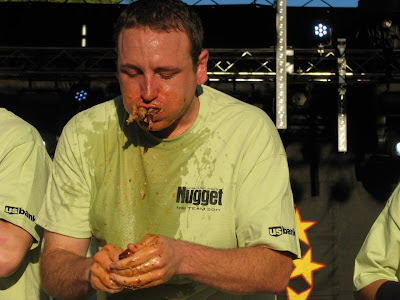 It is time for Coney Islands annual "Nathan's Famous Hot Dog Eating Contest.." Joey 'Jaws' Chestnut may have some competition from his new young nemesis Matt 'Megatoad' Stonie. Be sure to check your local television listings for the 12 est. noon contest. Three Dogs BBQ, After watching the contest I always want to grill some dogs. Not as many as Joey Chestnut will eat. No grilling for me today. I'm heading to Smokey J's. hope y'all have a great day. I postponed smoking for this weekend (a few picnics and beef ribs are on the list) because we were supposed to get 5 inches of rain today. Sure enough, been overcast all day and a few light drizzles but they sure blew this forecast. Kailyn, We paid a visit to Smokey Js last week. Fantastic brisket. It was heck of smoky inside so we ate at the table outside. Chris, The weather has been strange everywhere. You have me thinking about making pimento cheese burgers. Lea Ann, It sounds like a yummy full plate. The grilled jalapeno cheddar bratwurst sounds delicious. I think I could eat 69 of them. Joey Chestnut was victorious by eating 69 hot dogs in 10 minutes. Go Joey!!!!!!!!!!! Lea Ann, I'm hitting the "like" button on your comment. BLECH!